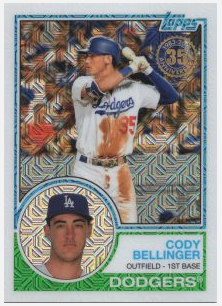 2018 Topps Baseball Series 1 arrives on January 31 everywhere. But only your local card shop will carry exclusive Topps Baseball Series 1 Silver Pack cards. Each pack contains four chrome cards commemorating the 35th anniversary of the 1983 Topps Baseball design with an exclusive refractor pattern. Collectors have a chance to find various color parallels as well as randomly inserted autographed cards of some of their favorite players including Derek Jeter, Hank Aaron, Mike Trout and more. Silver Packs will be included with the purchases of 2018 Topps Baseball Series 1 at participating local card shops. Buy a hobby box (36-packs boxes) an you will get One (1) silver pack. Buy a Jumbo Box (12 Jumbo packs) an you will get Two (2) silver packs. That’s the only way to get these Silver packs. Silver packs WILL NOT be included with purchases of Retail boxes. I have only one problem...where is a card of a player from my Detroit Tigers? Every team should be represented, no matter the wins and losses. Cabrera or Fulmer...not that hard.